Our 7th Coaches vs Parents Charity Match took place in aid of Sebastian's Action Trust on Sunday 15th February 2015. 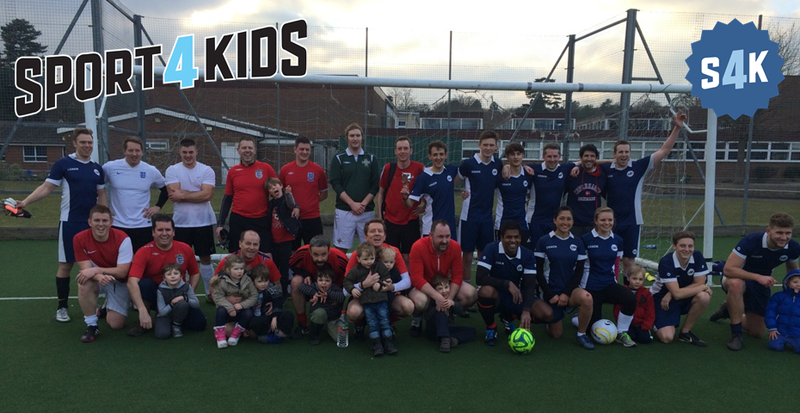 Despite being the day after Valentine's Day, mums and dads managed to bring themselves along with the kids to take part in an afternoon of fun with their favourite S4K Coaching Team (in fact we heard one of the dad's explaining to his family that this WAS in fact the fun-filled day out that they had been promised this weekend...). The fun was in high supply and the stretches and strains were kept to a minimum as the teams faced up in an 80 minute 11a side match. The coaching team moved through the gears seamlessly and raced into a 3-0 lead early in the first half before the parents began to find some momentum and take the game to our coaching team. Our coaches showed discipline and the odd bit of flair, but were matched by pacey, skillful and at times ambitious parents on a fast-paced afternoon of football. There was some awful goalkeeping (Coach Adam), a horrendous penalty (...Coach Adam) and a few moans and groans about injuries (... ... Coach Adam) during an intense game between two well matched sides. Despite some controversy surrounding the final score (parents insisted it was 7-7, while coaches believe it to be 7-6 in their favour), the matter was settled on penalties in favour of the S4K coaches. The result is irrelevant - the afternoon was fantastic and enjoyed by all who participated. We were extremely proud of everybody who took part and are looking forward to seeing everybody next time around - Sunday 17th May @ Charter's Leisure Centre in Ascot. Get limbering up!